Fantastic nostalgia-bait RPG that feels authentic, plays familiar and looks amazing. Nostalgia is a great way to convince people to part with their hard-earned money. Just look at the thousands and thousands of indie games aiming to get some easy money with a pixel art presentation and little else – what’s more, for a while there it totally worked. In today’s increasingly stacked market of fond memories resurrected, however, you need to try a little harder. 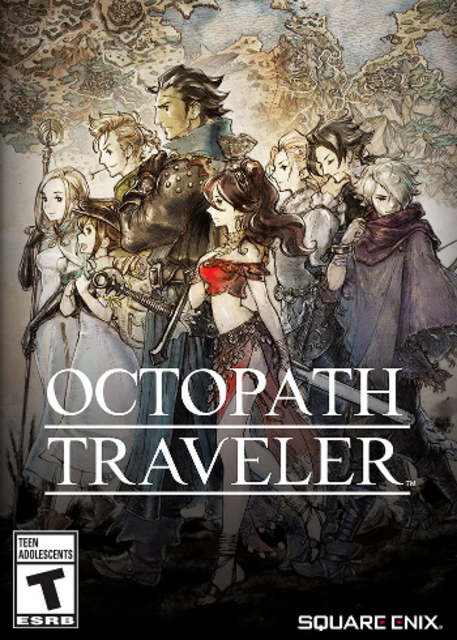 Thankfully, developers have stepped up to the challenge with games like Sonic Mania, Cosmic Star Heroine and today’s subject, Octopath Traveler, a classic-style RPG with modern trappings that feels right at home on the Switch. Nostalgia’s not going anywhere, so if you want to take a trip back to your childhood without all the complicated time-paradox stuff, here you go. You begin by choosing one of the eight characters to serve as a protagonist. They run the gamut of RPG archetypes from your badass loner thief to your noble warrior to your benevolent cleric; I found myself more fond of the more unusual options like Tressa the merchant, Primrose the assassin/dancer and in particular Alfyn the apothecary. That last one ended up being my main character thanks to how much I adored his special item-combining abilities. Your main character will be spending all their time in your party, but you’ll end up recruiting the rest of the cast as you go. You can switch out party members but your protagonist sticks around, which lends an interesting value decision to the rest of your party. As Alfyn, for instance, my healing needs were covered, so Ophilia the cleric was inherently less useful; meanwhile, characters like Therion the thief and Tressa were more valuable because of the huge amount of materials and money I needed to fuel Alfyn’s alchemy. This makes each player’s adventure through Octopath Traveler feel unique based on their initial character. Characters have unique abilities both in and out of combat. In combat, each class has their own skillset with unique capabilities that can help get you through; even more unusual characters like Primrose have buffing and damaging options that can add something to the team. Later in the game, you can assign each character a secondary class, adding that class’ stat bonuses and skills to their repertoire. Outside of combat, each character has a unique Path Action that typically alters your interaction with NPCs. These include stealing items, purchasing items (stealing them except you’re paying and thus can’t fail), inquiring for more information and, I’m serious here, talking the NPCs into joining your party and helping you in combat. Two of the characters even have the ability to beat up NPCs for basically no reason outside of sidequests. It’s kind of fantastic and lends a lot of personality to the characters and world. This is all held together by a traditional turn-based combat system and plenty of classic RPG exploration. Combat features elements inspired by Shin Megami Tensei (a heavy focus on exploiting enemy weaknesses) and Bravely Default (saving up energy to boost your attacks in later turns) so fans of either of those series are bound to have a good time, though you probably shouldn’t expect this one to change your mind if you’re not fond of turn-based battles. Exploration, meanwhile, has loads of stuff to discover and loot, so paying attention to your surroundings ends up being rewarding in just the right way. There’s plenty of story content to check out as well – you’ve got your main character’s plot to follow as well as the rest of the cast. Between all of that and side quests, you won’t be hurting for things to do anytime soon. Enough about gameplay, though: have you seen this game in action? Octopath Traveler’s “HD-2D” look is absolutely amazing. If you’ve played the classic PS3 action-adventure title 3D Dot Game Heroes you’ve got an idea of what you’re in for here – it’s a classic title taken to new heights by modern console horsepower. Everything looks absolutely fantastic, combining nostalgia with modern beauty. Octopath Traveler has to be seen (and heard, since the music is great) to be believed. Really, if you enjoy classic RPGs you can’t go wrong with Octopath Traveler. If you’re from the more modern set who’s not especially fond of grinding and exploring to get things done, you might be a little less fond of this one. Personally, though, this is like playing a long-lost SNES RPG. That’s really all I need out of life. If you feel the same, go out and pick this one up post haste.